1. Break the cinnamon stick into 2 and out it into a pan. Crush the ginger pieces and add to the pan. 2. Now add the remaining ingredients for the sugar syrup in a pan. Place it on medium heat, and keep stirring till all the sugar dissolves. Bring to a boil, then cover with the lid and let it boil for a minute. 3. Uncover, turn down the heat and allow to simmer for 5 minutes and take it off the heat. Cool the syrup and chill in the fridge for at least 6 to 8 hours, preferably overnight. 4. The sugar syrup must be ice cold when ready to use. Remove the cinnamon and ginger pieces before using syrup. 1. Sift the flour, baking powder and salt together and rub the butter into the mixture, till it resembles breadcrumbs. 2. Add the milk, water and lemon juice to this and knead till the dough is very soft and elastic but not sticky. You should be able to roll it out easily. 3. Cover the dough with plastic wrap and allow it to rest for about 2 to 3 hours, or even overnight in the refrigerator. 4.To make the koeksisters, roll out the dough to about a little less than 1/4" thickness. Cut out strips about 5" long and a little under 1/2" wide. You can decide how long or short you want the strips to be depending on what length you want to make your koeksisters. 5. Braid 3 strips together pinching both ends together very well, or they will unravel while being fried. Repeat with all the strips of dough. 6. Heat the oil over medium heat until quite warm but not too hot. If the oil is too hot, the koeksisters will be brown on the outside, but raw on the inside. When the oil is at the correct temperature, it will take 10 seconds for a piece of dough to pop to the surface after it has been dropped into the oil. Keep the chilled sugar syrup ready. 7. To ensure that the syrup doesn't get warm, you may place it in a bowl of ice, or take out only half the syrup out of the refrigerator. When this gets warm, use the other half. Drop the braided dough, about 4 at a time into the oil and fry them till they're brown on both sides and done. 8. Remove 2 at a time, with a slotted spoon and drop them straight into the sugar syrup keeping them submerged in the syrup. Keep them in the syrup till they've soaked through. 9. Remove them from the syrup and place on a wire rack allowing the excess syrup to drip onto a plate below. 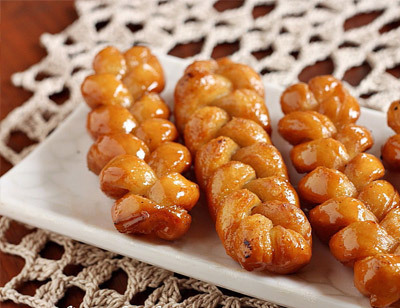 The koeksisters can be stored in the refrigerator is not serving immediately, to retain their crispness.